From beautiful beaches and impressive countryside, to modern metropoles and fascinating historical landmarks, the South of England really has something for everyone. This region includes counties like Sussex, Devon, and Somerset, as well as the UK’s capital city, London. A trip to the South of the UK would be incomplete without exploring some of England’s beautiful current and old royal residences. The most famous of these is Buckingham Palace in London: built in the early 1800s, and with 775 ornate rooms, this is the Queen’s official royal residence. Another London must-see is the Tower of London, which served as a royal residence and defense system until the 17th century, and is now home to nearly 24,000 crown jewels. The Queen spends many of her weekends in Windsor Castle. 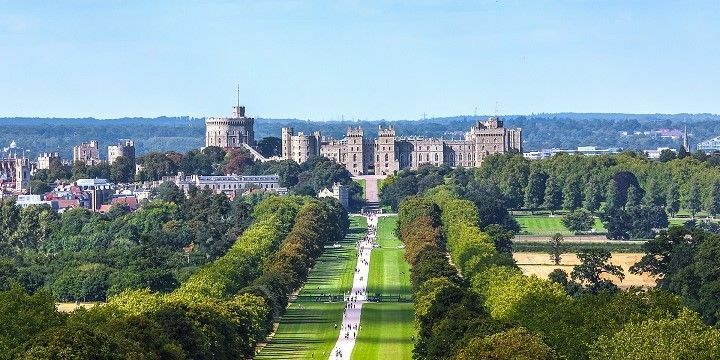 Just west of London lies Windsor Castle, where the Queen spends many of her private weekends. This castle has over 900 years of royal history, and is the largest occupied castle in the world. Alternatively, check out Leeds Castle which — despite the misleading name — is actually in Kent. Once used by Henry VIII as a dwelling for his first wife, Catherine of Aragon, Leeds Castle is now famous for its gardens, maze, and falconry. Some of the country’s oldest landmarks can be found around Bath in the Southwest, such as the Roman Baths (from which the city got its name). Built in the first century A. D., this site is home to some of the best-preserved Roman baths in the world. 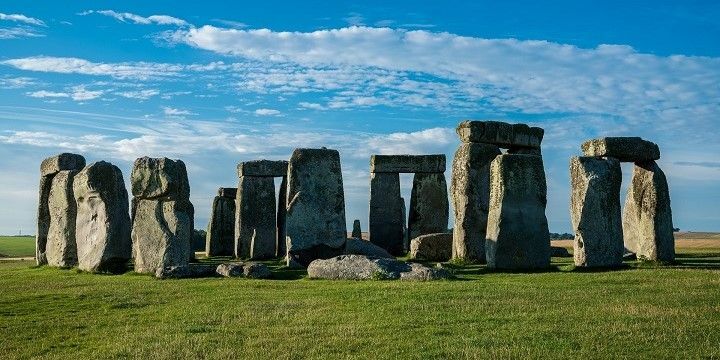 Even older history can be found at Stonehenge, a rock formation that archaeologists estimate was built in 2000 B. C., and was probably used for religious ceremonies. Stonehenge was most likely built in 2000 B. C.
London is home to some newer architecture; for example, the Shard, which is the UK’s tallest building (300m). Just 30 kilometers southeast of the city, you’ll find Bluewater shopping center. This mall opened in 1999 and took ten years to build, as it was carved out of a former chalk quarry, and remains surrounded by chalk cliffs. The South is famous for its real cider (a still alternative to the fizzy, preserved drink). If you want to try a delicious pint for yourself, head to Weston’s orchards in Herefordshire, which originally opened in the 1880s. Be sure to take a tour and learn about the entire cider-making process, from the tree to the bottle! What many people don’t know, is that the UK has also recently seen a boom in wine production. Head to Camel Valley vineyard in Cornwall, or Biddenden Vineyards in Kent to taste some of the country’s best wine! There are plenty of opportunities to try your hand at surfing along England’s south coast: Watergate Bay in Cornwall is perfect for beginners and professionals alike, as its cliffs shelter the waves at high tide. If you’re not yet ready to take to the waves, head to Watergate Bay in May, when you’ll see the English National Surfing Championships. Alternatively, check out the beautiful sandy beaches in areas like Plymouth and Brighton. Watergate Bay in Cornwall is great for surfers. Southern England is home to a vast array of forests and woodlands. Perhaps the most famous of these is the New Forest, the third largest forest in the UK. This is a great spot for animal lovers, as 3,000 ponies, and 100 donkeys roam around the park freely. Alternatively, check out Thetford Forest, which spans across parts of Norfolk and Suffolk. At nearly 190 square kilometers, this is the largest man-made forest in the UK, and is the perfect spot for running, horse riding, and mountain biking. If NextStop24 helped you to choose your next travel destination, we'd be very grateful if you’d search for your accommodation and things to do in southern England through these links. They're affiliate links, which means that we will receive a small commission for every booking made through them. There are no extra costs for you; you'll simply be helping to keep NextStop24 running. Thanks! The South has SO much more to offer than London! The county of Essex is just a short train ride away and offers gorgeous beaches (e.g. in Leigh-on-Sea), fascinating history (e.g. Colchester Castle) and awesome shopping (e.g. Lakeside Shopping Center). The city of Cambridge is iconic and a must-see during your trip. I'd recommend punting down the river and treating yourself to a baked good in the small cafes around the city. Brighton is such a vibrant city. Often labelled the gay capital of the UK, it's full of life, color and all things fun and fabulous. Chill on the beach, shop in "the Lanes", or enjoy the awesome nightlife scene.